The Sand Dollar or Holy Ghost Shell is one of the most unusual specimens of marine life. The markings on the shell symbolise the Birth, Crucifixion and Resurrection of Christ. On the top side of the shell, an outline of the Easter Lily is clearly seen. At the center of the lily a five pointed star representing the star of Bethlehem appears. The five narrow openings are representatives of the four nail holes and the spear wound made in Christ during the Crucifixion. On the reverse of the shell there is an easily recognizable outline of the Christmas poinsettia and also the bell. when broken, inside the shell are five little birds called doves of peace, some say they are Angels that sang to the shepherds the first Christmas morning. Lead, Nickel & Cadmium Free! 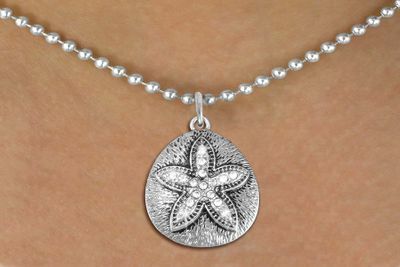 Necklace Suspends A Detailed Antiqued Silver Tone Sand Dollar Charm, That Is Accented With Faceted Clear Crystals. Comes On A Necklace Style Of Your Choice: Ball Chain, Regular Chain, Snake Chain, Or Black Suede Leatherette.